Last April, nine bloggers and journalists were arrested in Ethiopia. Several of these men and women had worked with Zone9, a collective blog that covered social and political issues in Ethiopia and promoted human rights and government accountability. And four of them were Global Voices authors. In July, they were charged under the country’s Anti-Terrorism Proclamation. They have been behind bars ever since, their trial postponed time and again. Last week, we featured our debut post from a series – “They Have Names” – that hopes to highlight the individual bloggers who are currently in jail. We wish to humanize them, to tell their particular and peculiar stories. This week, Ghanaian author, Kofi Yeboah, writes about the youngest of the Zone9ers, Atnaf Berahane. 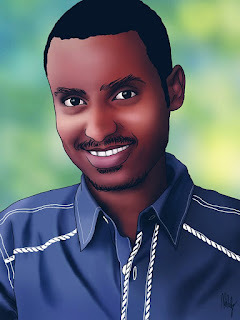 Atnaf Berahane, 26 years old, is the youngest of the Zone9 bloggers. He was arrested in Ethiopia on April 25 and 26, 2014 alongside Abel Wabela, Befeqadu Hailu, Mahlet Fantahun, Zelalem Kibret, and Natnael Feleke (all members of the Zone 9 blogging collective) and journalists Asmamaw Hailegeorgis, Tesfalem Waldyes and Edom Kassaye. Ethiopia is a country where freedom of expression is repressed by the government. There is strict media regulation in the country, especially when it comes to discussions of politics and human rights. As a result, citizens read news mostly from the Internet. Atnaf's passion for civic engagement and interest in disseminating information to citizens to understand what the constitution says about their right and freedom led him to co-found the Zone9 Blog: his passion for human rights activism ignited the interest to co-found the organisation. But his passion for human rights and freedoms left him in chains. In real life, Atnaf is an ICT specialist who works with Addis Ababa city administration at Bole sub-city. The trailtrackerblog, where supporters post regular updates about the case and the bloggers’ condition, describes him as a young Ethiopian who is “known for his use of Twitter handle for hyper local updates.” Atnaf also runs his own blog and is a digital security expert. Is it the “Federal Republic of Ethiopia” or the “Republic of Dystopia” (police state)? Ethiopia today might as well be called the “Republic of Dystopia”. Young men and women barely in their 20s are arrested and jailed for “terrorism” merely for blogging on Facebook and speaking their minds on other social media. Atnaf, together with other incarcerated Zone 9 bloggers, deserve praise and not a jail sentence. It is not only the future of Atnaf that is on trial but that of every aspiring young man/woman who dares take a repressive government to task on free speech.